Glucomannan Plus is one of the newer additions to Evolution Slimming’s range of dietary supplements. The company is one of the most respected supplement manufacturers in the online world, they back all of their products with a 30-day money back guarantee, and offer customers telephone support via a free phone number. The company website also provides a mailing address and online contact form, so Evolution Slimming get top marks for customer services. However, past results can never be seen as a guarantee for future success and even the best of companies can and do get it wrong sometimes, so let’s take a better look at Glucomannan Plus and see if it can hold its own under close scrutiny. What is Glucomannan Plus and how does it Work? Evolution Slimming market the product primarily as a “weight loss complex” and the main ingredient (glucomannan) has been scientifically proven capable of providing powerful appetite suppression, so there is every likelihood the formulation will deliver good results as a weight loss provider. However, the capsule usage instructions vary depending on whether Glucomannan Plus is being uses as a weight loss provider, to control cholesterol levels, or by diabetics who wish to control their blood sugar levels. Glucomannan is believed to be capable of doing all of these things and more, but we feel a doctor’s involvement is necessary in the last two areas so our evaluation is of Glucomannan Plus as a weight loss aid only. Usage Instructions For weight loss, two capsules should be taken with a large glass of water three times a day, 15-30 minutes before eating a meal. The main ingredient is glucomannan and the amount included here is consistent to that used in many of the studies that are supportive of the ingredients weight loss-providing abilities. 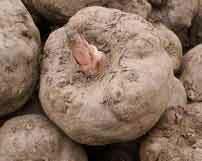 Glucomannan is a water-soluble fibre that is extracted from the roots of an Asian plant called konjac. High fibre foods are known to be beneficial for the health. 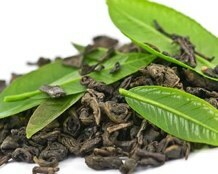 They encourage efficient bowel movement and are believed to help reduce the likelihood of cancer. However, glucomannan has an ability that sets it apart from many other dietary fibres—it is extremely absorbent. When glucomannan is brought into contact with a source of moisture, such as water, the fibres expand and combine with the fluid to form a gelatinous mass. When this reaction occurs inside the stomach, capsule users will experience a feeling of fullness and their appetite will be reduced accordingly; thus ensuring they are unable to eat as much food as normal. This will lead to a significant reduction in the amount of calories consumed and the body will then be forced to start burning body fat to obtain the extra calories it needs. Chromium has a longstanding reputation as a fat burner and has recently become revered as an n appetite suppressant. The amount included here may be too low to make the inclusion worthwhile, but it is also insufficient to interfere with the capabilities of the other two ingredients. The capsules are suitable for vegetarian use and no side effects have been reported, but we always recommend pregnant or breastfeeding mothers seek medical advice before using any brand of supplement. We offer the same advice to people who are taking medication or have existing health issues. 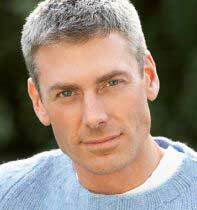 A 30 day money back guarantee is offered. 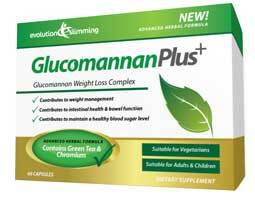 Glucomannan Plus contains a powerful appetite suppressant and also offers the added support of a proven fat burner. The scientific evidence available at the present time suggests the combination and quantity of ingredients used in the formulation should deliver good weight loss results. 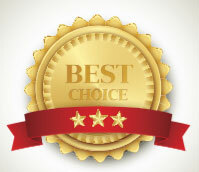 Customer feedback also suggests a product that works and the offer of a guarantee ensures customers can buy secure in the confidence they have nothing to lose. Glucomannan Plus is a highly recommended weight loss product. 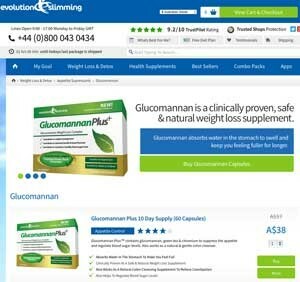 A 30 day supply of Glucomannan Plus costs A$38 (as low as A$32 when 3 months supply is purchased) from the Evolution Slimming online store. There are special offers and discounts from time time. Evolution Slimming offers a 30 day money back guarantee on all of their products and ship to all countries.